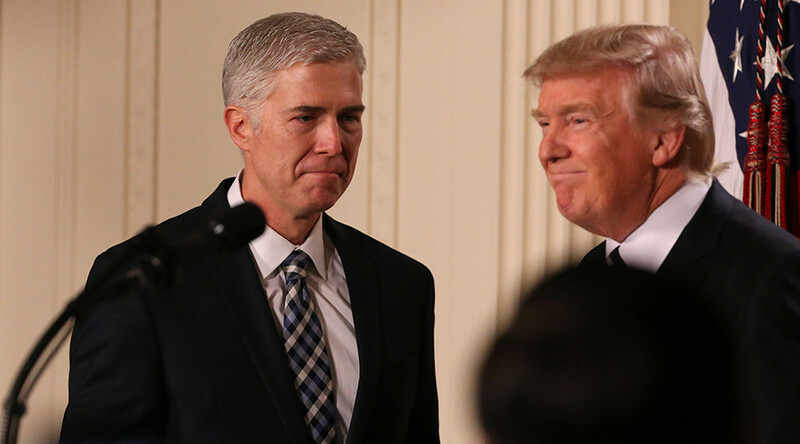 Neil Gorsuch is President Donald Trump's pick for Supreme Court justice, the president announced in a Facebook Live video Tuesday evening. Gorsuch, 49, is a US Circuit Judge of the US Court of Appeals for the Tenth Circuit, which covers six states. Gorsuch would be the youngest addition to the high court since Supreme Court Justice Clarence Thomas, who was 43 years old when he was confirmed in 1991. Trump invited Gorsuch and his wife to stand next to him at the podium during the announcement. Gorsuch then took to the podium himself, saying that he was "honored and humbled." Trump said in the announcement that he promised to "find the very best judge in the country," who "loves our Constitution" and will interpret it "as written." Trump cited his list of considered justices as an example of why this was the "most transparent judicial nomination process in history." Trump promoted Gorsuch's previous Senate confirmation as one that reached bipartisan consensus. "Judge Gorsuch is a brilliant jurist with an outstanding intellect and a clear, incisive writing style," a White House statement reads. "He is universally respected for his integrity, fairness, and decency. And he understands the role of judges is to interpret the law, not impose their own policy preferences, priorities, or ideologies." He was confirmed by the Senate to the Tenth Circuit US court of appeals in 2006. The White House lists 11 current Senate Democrats, including Minority Leader Chuck Schumer of New York and Sen. Dianne Feinstein of California, as having voted to confirm him nearly 11 years ago. Members of the Senate Judiciary Committee reacted on Twitter. Judge Gorsuch is a tremendous pick for the Supreme Court and I look forward to doing everything I can to ensure he is confirmed by Senate. The independence of our judicial system--esp. #SCOTUS—is more critical than ever. That's the context in which I'll review this nomination.